Här är nummer 1 av en intervju med Eric Singer. KISS fans know Eric Singer is a talented drummer. 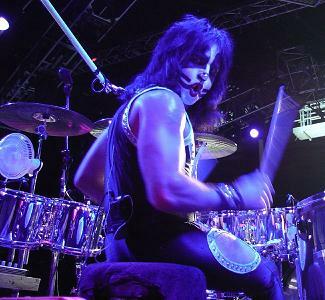 But perhaps more notably, Eric Singer is full of passion. And, as he is apt to point out, he can sometimes go on tangents. Eric speaks candidly when it comes to his career and he is happy to share his philosophy on how he has been able to stick around in a business where the odds are stacked against success. When the conversation turns to Paul Stanley and Gene Simmons, there is a reverent tone in his voice. So strap in as we cover with Eric, among other topics, many things KISS, drums, his father the bandleader, the reunion, the music business, Olivia Newton-John (yes, Olivia Newton-John), and the other albums and projects in which he’s participated over a successful career that has now spanned more than a quarter century. Läs hela intervju del 1 här.